Database administrators spend a lot of time provisioning hardware, installing and patching operating systems and databases, and managing backups. All of this undifferentiated heavy lifting keeps the lights on but often takes time away from higher-level efforts that have a higher return on investment. For many years, Amazon Relational Database Service (RDS) has taken care of this heavy lifting, and simplified the use of MariaDB, Microsoft SQL Server, MySQL, Oracle, and PostgreSQL in the cloud. AWS customers love the high availability, scalability, durability, and management simplicity of RDS. Earlier this week we announced that we are working to bring the benefits of RDS to on-premises virtualized environments, to hybrid environments, and to VMware Cloud on AWS. You will be able to provision new on-premises database instances in minutes with a couple of clicks, make backups to on-premises or cloud-based storage, and to establish read replicas running on-premises or in the AWS cloud. 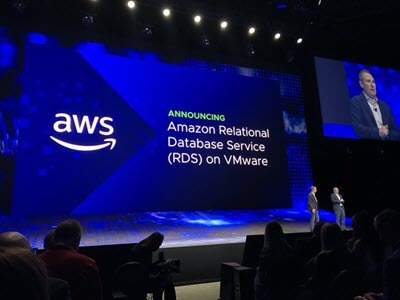 Amazon RDS on vSphere will take care of OS and database patching, and will let you migrate your on-premises databases to AWS with a single click. Architecture – Your vSphere environment is effectively a private, local AWS Availability Zone (AZ), connected to AWS across a VPN tunnel running over the Internet or a AWS Direct Connect connection. You will be able to create Multi-AZ instances of RDS that span vSphere clusters. Backups – Backups can make use of local (on-premises storage) or AWS, and are subject to both local and AWS retention policies. Backups are portable, and can be used to create an in-cloud Amazon RDS instance. Point in Time Recovery (PITR) will be supported, as long as you restore to the same environment. Management – You will be able to manage your Amazon RDS on vSphere instances from the Amazon RDS Console and from vCenter. You will also be able to use the Amazon RDS CLI and the Amazon RDS APIs. Regions – We’ll be launching in the US East (N. Virginia), US West (Oregon), Asia Pacific (Tokyo), and Europe (Frankfurt) Regions, with more to come over time. If you would like to be among the first to take Amazon RDS on VMware for a spin, you can Register for the Preview. I’ll have more information (and a hands-on blog post) in the near future, so stay tuned!